Cooking can be a messy business, especially if you don’t have a lot of counter space. If you love cooking but don’t have a million tiny bowls, you also end up with all of your dishes being dirty by the end of the night. Scraps and peels end up all over the place as well, but the finished product is usually worth the work. If you like keeping things clean and organized throughout the whole process, then you might like the Sous Chef Prep Station. This is a cutting board and container combination that will help you keep your fruits and veggies organized after you chop them up. 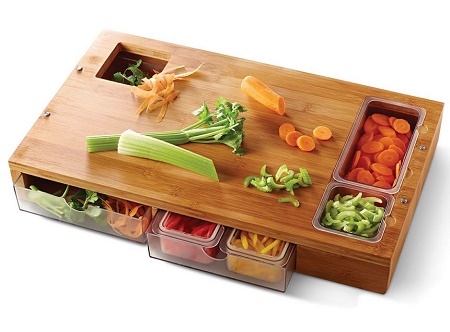 It uses an anti-bacterial bamboo cutting board and six slide in/out plastic containers around the sides and underneath to keep things separated when they’re finished. This would make transferring food to a pan far easier as well. Of course, if you want to prep everything and cook later, you’ll be happy to know that there are lids so you can store chopped items in the fridge so they can await your return to the kitchen. In the corner of the cutting board is a scrap chute so you can collect all the undesirables underneath the board to be thrown away later. The plastic containers are BPA-free and are safe to be put in the microwave or dishwasher. This whole setup will cost you $199.95.